Thanks for all of the feedback and ideas to help us connect with more female entrepreneurs! Recently, we shared some of the reasons for why we want to invest more in women entrepreneurs. The summary is that companies with women leaders often perform better than ones without women leaders. We were amazed at the interest and response from our community. It turns out we’re not the only ones thinking about women company founders and leaders these days. Several publications have been highlighting women leaders with “top lists”. Aditi Ravichandar commented on our Facebook post with a great piece from Business Insider, “The 30 Most Important People in Tech”. As the article points out, while there are relatively few women in tech, they are doing really important work. 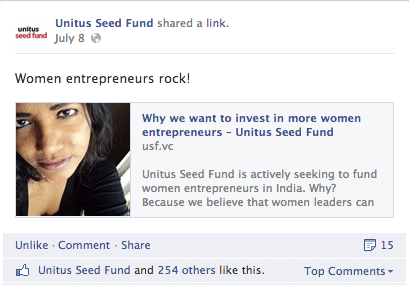 Similarly, Sandeep Jaiswal posted a great article on the “10 Upcoming Female Social Entrepreneurs of India”. Here again, women may be few in numbers but they are making up for it with innovation and business acumen. So we’ve covered the facts that women make great leaders and entrepreneurs, but we haven’t tackled why their numbers are low. It turns out funding could be one barrier. Our friend, Ross Baird at Village Capital discussed this issue in a recent Fast Company article. Companies that come out of Village Capital’s startup accelerator program with women cofounders are 50% less likely to get follow-on investments than their all male counterparts. However, women-led companies from their cohorts are 15% more likely to be profitable. Baird attributes this to the fact that “women undersell”. Whether or not this is the true reason, as investors, we play a big role in creating a more balanced fundraising environment. One of our team members, Eleanor Horowitz, shared an interesting link on Gender Lens Investing. According to the page, gender lens investors “use gender as a category of analysis when making investment decisions”. The thought is that more investments in women-led ventures or in businesses that support women and gender equality will drive both impact and return. Here at Unitus Ventures (formerly Unitus Seed Fund), we’re all about helping entrepreneurs successfully prepare their ventures for growth. We’d like to fund more startups with women leaders and co-founders. If you know of any early-stage startups with women leaders, please tell them to contact us. Let us know your thoughts in the comment section below or on Facebook and Twitter.